Lacto-Fermentation is a great way to get probiotics into your diet. You might think of it like pickling but it is not pickling in the traditional sense as in store-bought pickles. Let’s see how they are different. 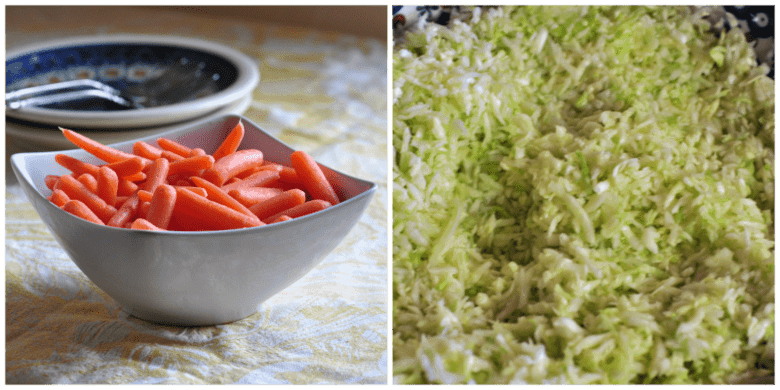 You may have noticed my latest recipe additions – Sauerkraut and Fermented Carrots – contain fermentation in the process. Being on the GAPS Diet and reading about the health benefits of probiotics, I have purposefully added them to our family’s diet. One way to get probiotics is through fermented foods. But, not just “fermented” as in pickled, I mean “fermented” using the lacto fermentation process. So, what is lacto fermentation and why is it so healthy? The result of lacto-fermentation is the proliferation of lactobacilli. They increase the vitamin levels and make the fermented foods more digestible. These beneficial bacteria, lactobacilli, produce helpful enzymes. Antibiotics and anti-carcinogenic substances help with the process too. It helps preserve vegetables and fruits. Promotes the growth of healthy flora (or bacteria) throughout the intestines. Lactic acid is a natural preservative that inhibits bacteria which putrefies. Vegetables and fruits contain starches and sugars. They convert into lactic acid by the lactic-acid-producing bacteria. There are many species of these bacteria. Lactobacilli in particular is present on all living things. Encourage this one to grow, and you’ll have success! Please keep in mind that this is a very specific type of fermentation. Not every fermentation recipe will use lacto-fermentation. But for those that do use this process, it’s important to follow the steps in the process. You don’t want to throw off the very delicate balance that goes into this process! Lacto-fermentation is simple, yet so complicated. The ancient Greeks understood that important chemical changes took place during this type of fermentation. Their name for this change was “alchemy.” Like the fermentation of dairy products, preservation of vegetables and fruits by the process of lacto-fermentation has numerous advantages beyond those of simple preservation. The proliferation of lactobacilli in fermented vegetables enhances their digestibility and increases vitamin levels. These beneficial organisms produce numerous helpful enzymes as well as antibiotic and anticarcinogenic substances. Their main by-product, lactic acid, not only keeps vegetables and fruits in a state of perfect preservation but also promotes the growth of healthy flora throughout the intestine. Other alchemical by-products include hydrogen peroxide and small amounts of benzoic acid. Lacto-fermentation has a long-running history. A partial list of lacto-fermented vegetables from around the world is sufficient to prove the universality of this practice… Cucumbers, beets and turnips are also traditional foods for lacto-fermentation. Less well known are ancient recipes for pickled herbs, sorrel leaves and grape leaves. In Russia and Poland one finds pickled green tomatoes, peppers and lettuces. Lacto-fermented foods form part of Asian cuisines as well. The peoples of Japan, China and Korea make pickled preparations of cabbage, turnip, eggplant, cucumber, onion, squash and carrot. Korean kimchi, for example, is a lacto-fermented condiment of cabbage with other vegetables and seasonings that is eaten on a daily basis and no Japanese meal is complete without a portion of pickled vegetable. American tradition includes many types of relishes–corn relish, cucumber relish, watermelon rind–all of which were no doubt originally lacto-fermented products. The pickling of fruit is less well known but, nevertheless, found in many traditional cultures. The Japanese prize pickled umeboshi plums, and the peoples of India traditionally fermented fruit with spices to make chutneys. Basically, the lacto-fermentation process uses good quality produce, sea salt and water. Good quality produce provides the nutrients necessary for the lactobacilli to work. Sea salt inhibits the growth of putrefying bacteria until enough lactic acid is produced. Vegetables preserve for many months once a sufficient amount of lactic acid is produced. People use fermented food starters, kefir or whey to “jump-start” lactic-acid producing bacteria’s growth. They help to make the fermentation process more consistently successful. So why is the process is not used on a large scale for profit? The answer is simple. The lacto-fermentation process did not yield consistently predictable results when converted to an industrialized process. Changes were made to produce a more uniform product. Unfortunately, that does not result in a more nutritious one. With the recipes I have posted utilizing the lacto-fermentation process, as well as any others you might find, remember a couple of important things. Lacto fermentation is an anaerobic process and once fermentation begins, the presence of oxygen will affect your results. If you do not have something weighing the cabbage down below the surface of the liquid, you should push it down into the liquid using a clean spoon, morning and evening. Mold grows on any surfaces exposed to air. Scoop this out and thrown away—it’s easy. The remaining sauerkraut will be just fine. But, if your fermented vegetables taste or smell rotten – throw them out and start over. I have made many batches of both sauerkraut and fermented carrots and only one batch of sauerkraut went awry. There was no question that something was wrong and I threw it out and started over! The vegetables will expand slightly and may even become bubbly during the fermentation process. Make sure to leave a 1 inch space between the top of the vegetables and the top of the jar. Some brands of lacto-fermented vegetables are available through health food stores, they tend to be rather expensive. I enjoyed the adventure of learning the process and trying new recipes. Cooking should always feel like an adventure! What is Your Favorite Fermented Food Recipe?